Thank you so much for your wonderful support during our December End of Year Campaign. We raised over $10,000 for our school which is an enormous help and keeps us open and running for several months. We thank you from the bottom of our hearts! Normally in these reports, I write about our students who come during the day for their free arts lessons and our resident children who are orphaned and some of whom are blind. 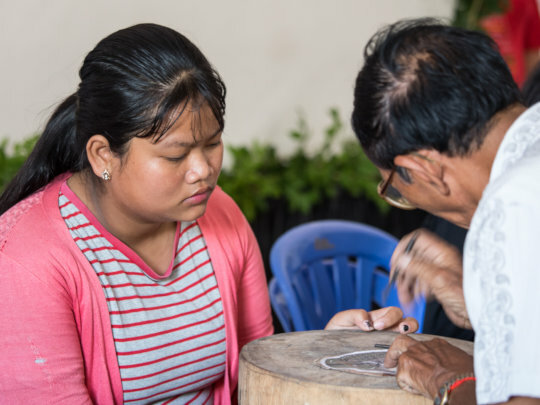 Today I would like to tell you about the Kampot Arts Festival which was held for three days in January in coordination with Epic Arts and Sarawasati Press. 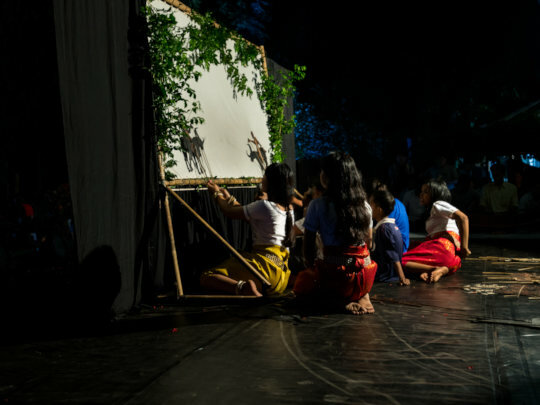 The idea of the Kampot Arts Festival which will also be held next year, is to support Cambodian artists by allowing them a voice and a platform on which to perform or show their arts. The emphasis is on tradititional arts, but also embracing contemporary arts too. 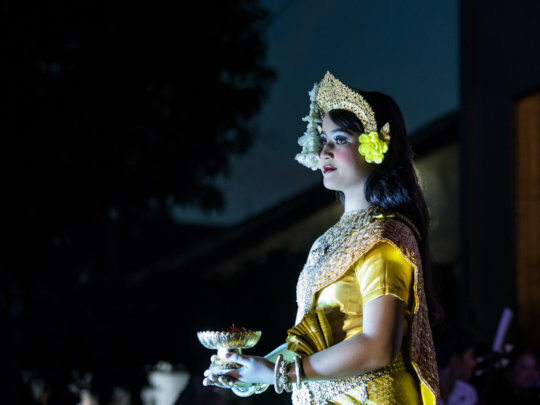 More than at any time, are Cambodian arts and culture, especially traditional arts, in danger of dying out completely. There is such an overwhelming wave of Westernization, capitalism and rapid destruction of architectural and cultural heritage that there is no time to be lost in putting measures in place to conserve Cambodian arts. The artists themselves are finding it harder and harder to make a living and their rich and ancient heritage risks being trampled underfoot by ignorant tourists and rampent real estate development, as well as unprecidented overeach by China into this small country. With an opening ceremony held at our school, both our resident children and outreach students performed the "Robam Chuon Puor" (Blessing Dance), traditional Mohori music performed by our blind students and fantastic shadow puppet theatre. 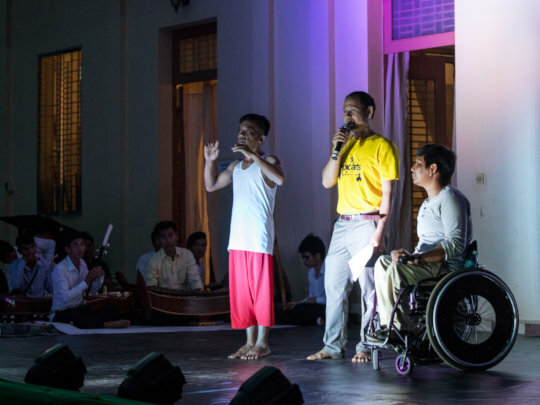 The wonderful contemporary arts NGO, Epic Arts gave a beautiful dance performance with their young adult students who are deaf and some also wheelchair users. The local Youth Club gave a performance of Folk Dance and one Epic Arts Studentsinterpreted all the different speeches in sign language. It was truly a special event. 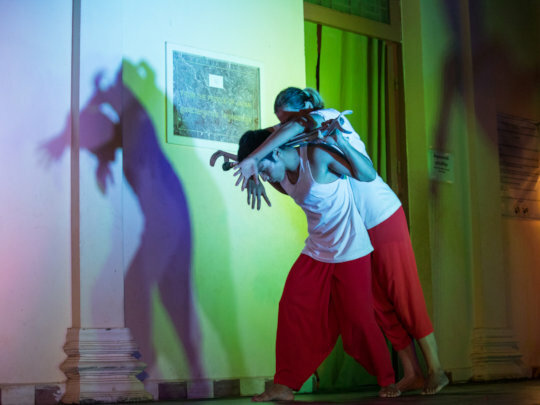 The next day our school opened it's doors to various shared activities with Epic Arts, these included painting and modern dance workshops, but also traditional dance, music and shadow puppet workshops given by our masters and oldest students. 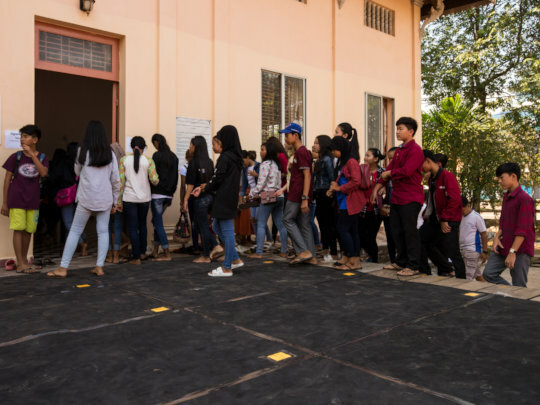 We were so happy when a large queue of young Cambodians came to learn about and participate in the arts. One of the most popular was the puppet-making workshop. It gave us hope for the future of Cambodia's culture when we saw so many young people joining in with such enthusiasm. Then at the very beginning of March we welcomed Cambodian University students from the American Stanford University in Phnom Penh. They came to our school for a shared lunch with our resident and outreach students and our teachers.Then after a performance given by our students, they talked about the importance of higher education and striving towards creating a positive life. They were very good role models for our own children. Their visit is one of several that we have had in the last few months, encouraging an exchange of ideas amongst our school and other higher education institutes. First of all on behalf of us all at school, we would like to profoundly thank you for your most amazing help and support during the Giving Tuesday and End of Year Campaign. Thanks to your generosity and to our chairman Dr Peter Carey's wonderful networking, we raised $10,000! That is an incredibly important contribution as it provides our school with over one third of our annual budget. Your support is being used to provide our children with food, clothing, medical care, electricity, water, support for our Braille teacher, our arts program and our childcare program. All our staff are Cambodian so that each donation goes straight to our school programs and our children without any waste on expatriate overheads, administrative costs etc, our board of directors is of course entirely voluntary. In January of 2018, we helped organise the first Kampot Arts Festival for Cambodian artists together with Epic Arts and Sarawasati Publishing. 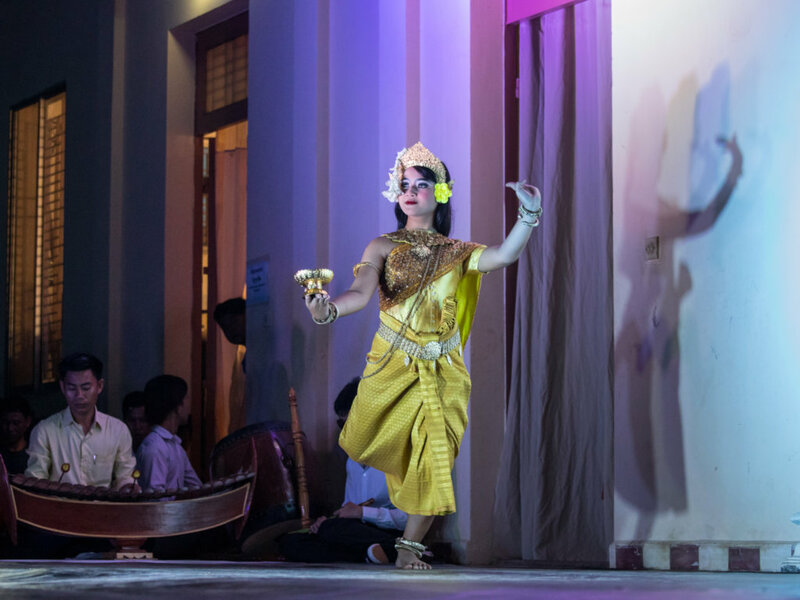 We are deeply concerned about the neglect of the traditional arts by the Cambodian Government and the sharp rise of Westernised practices which are threatening to wipe out Cambodian culture altogether. First there was the war, then the genocide and now greed and indifference. The opening ceremony was held at our school and our students performed the Robam Chuon Puor (Blessing Dance), Mohori and Pin Peat music (by our blind students) and traditional shadow puppet theatre. Epic Arts also gave a beautiful contemporary dance performance with their adult students some of whom are deaf or wheelchair users. The local youth club also gave a rendition of a lovely Folk Dance. The local Director of the Department of Culture came too. The next day we gave workshops on how to learn traditional Cambodian dance moves, Pin Peat music and how to make shadow puppets out of cured leather. Epic Arts also gave a contemporary dance and painting workshop at our school too. 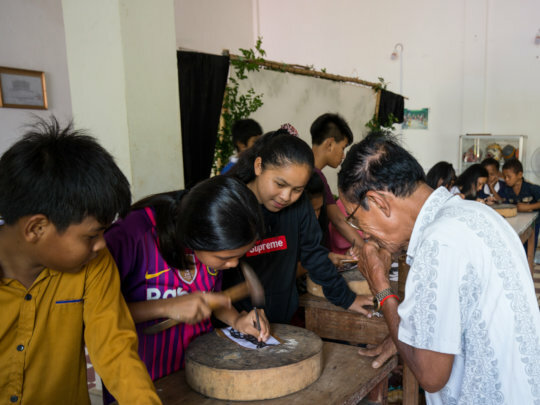 What was so lovely, was the queue of young Cambodians from the public wanting to take part and participating with such interest and enthusiasm. It really lifted our hearts, because it showed there was still hope for the arts in Cambodia. In December we had a Belgian technical team come and visit and give expert help in re-wiring our main hall and bedrooms, they even installed a washing machine and also generously donated new mattresses and cooking utensils. 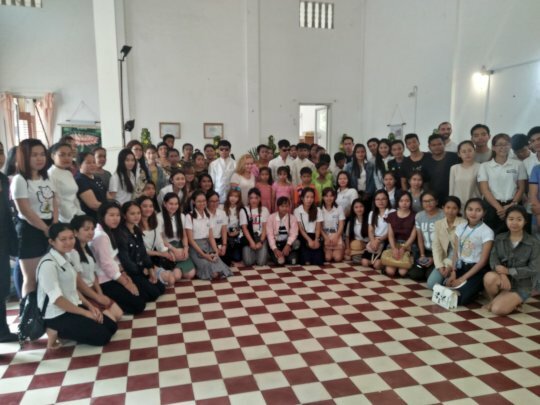 Meanwhile medical staff and doctors from the Sonja Kill Memorial Hospital in Kampot gave our children and staff a workshop on preventative hygiene and our cook went on a cooking and food hygiene course given by a local Italian Chef, who kindly did everything for free. This is because the Ministry of Social Affairs has issued new regulations for centres and schools such as ours, so our cook who is actually already a very good cook, undertook this extra training. Some of you also very kindly helped donate for two earlier appeals, one for transport for those of our special needs children who need to have medical care, some of it life-saving in Phnom Penh and in other provinces and in particular for one of our girls who suffered such a lot in her earlier life. Thevi (Not her full name) is now doing much better and after being diagnosed with epilepsy like her younger sister, she regularly receives treatment from the Russian Hospital in Phnom Penh, while her sister who is under fifteen, receives free medical care from the Kunthea Bopha Hospital. One of our little boys who has HIV and was hospitalised in December with the flu is now very well. 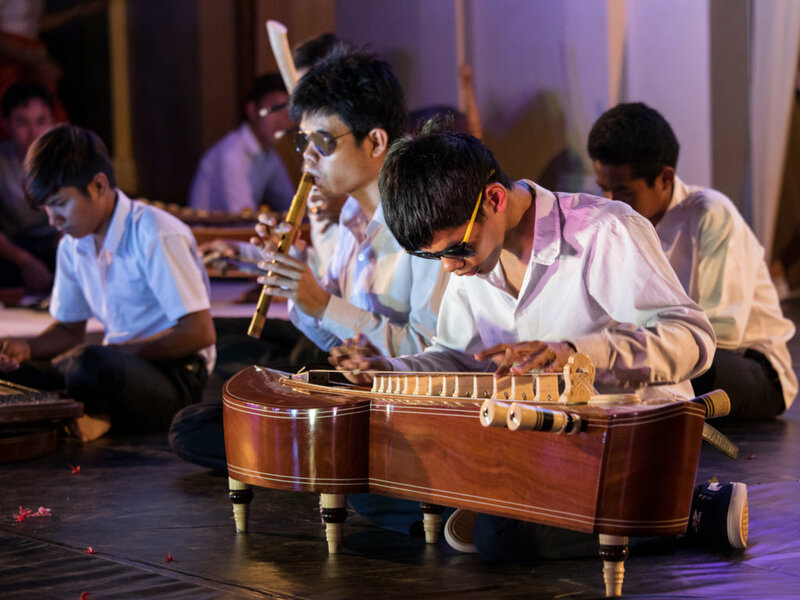 We are now developing our Outreach Program, so as to give free performing-arts lessons at our school to more children from local villages and pagodas, who would not otherwise receive this kind of training. I will keep you all updated on our progress. We do not at present have any major donor or sponsor, although for the first decade and a half, we were very lucky to have complete funding from Terre des Hommes (Netherlands), Memisa and various embassies and foundations. Today Cambodia is not considered as an emergency, although around 75% of the population live in rural areas, which have remained in absolute poverty and developed little in the last two decades. Cambodia seems to be two countries, one for wealthy urban Cambodians and expatriates and one for ordinary Cambodian people for whom human rights violations, land grabs, difficult living conditions, destruction of the environment by foreign investors is a fact of life. Still much of the population in rural Cambodia have no electricity or clean, running water, sewage, toilets, functioning health centres and so on, Tuberculosis is endemic and Malaria a killer and HIV still rife. Parents leave their children and disappear into Thailand to try and earn a living. Today thankfully there are less orphaned children, yet still we see that much of Cambodian society is not ready for loving and adequate foster-care. Many of our children have suffered as a result of being abused or sold into slavery by their extended family, or rejected for having HIV by their communities. The Ministry of Social Affairs is doing it's best to enforce strict regulations on childcare for orphanages and care centres and this has helped eliminate "false" orphanages and unfortunate practices. It is a lot work, but it's worth it! Thank you all so much for your heart-warming support. Each one of you has contributed to keeping our school open and running. My thanks also to Steve Porte for his most marvelleous photographs! Thank you for helping Thevi! Thank you so much for your incredible support and kindness in supporting Thevi. Thevi's problems have been very challenging and varied and I will try and raccount the voyage she has undertaken towards healing. As you will remember from her history, Thevi's mother died when she and her sister were very small and her father left them with their aunt. He went the other side of Cambodia to Battambang Province. A few years later her father then returned and took her and sold her to a couple. She therefore became a slave. The couple abused her physically and for three years from the age of eight onwards, she was forced to work for them and to endure neglect and violence. It took her aunt and remaining relatives three years to save enough money to "buy" her back from the couple. A sum of $100 with interest. It was not long after this that Thevi came to our school. Both she and her younger sister were in an extreme state of emotional and physical distress and needed immediate medical care to help them recover. They were severely malnourished and their hair was so full of lice, that the lice could not be removed properly and their hair had to be cut short and their old clothes thrown away. In time of course Thevi, (which to protect her identity is not her real name) developed Post Traumatic Stress Disorder and psychosis. She needed urgent psychological help and treatment to assist her in overcoming her disorder. This treatment she continues to have. ° We took Thevi to Kunthea Bopha Hospital in Phnom Penh, 137 km away for a brain scan. The doctors diagnosed epilepsy (her younger sister also has epilepsy). 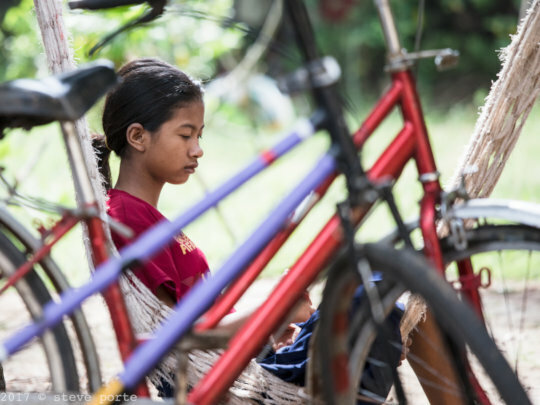 However because Thevi is now fifteen, the doctors could not give her the medical care she needed and sent her together with her housemother to the Russian Hospital in Phnom Penh to receive the correct medical treatment and prescription for further treatment. ° The dentist in Phnom Penh showed us that her teeth were very uneven and that this could create serious problems in the future. He very kindly offered to treat her for free and has fitted her with a brace. How wonderfully kind of him. She has regular check-ups and treatment in Phnom Penh. Thevi has now gained some much needed weight, because with all her health problems, especially with epilepsy, she was quite thin. She is blooming and feels much better and much happier. Just think how you have all helped her and improved the quality of her life. A Belgian NGO also gave us a donation and this helped us too, as we have to care for her younger sister who has very severe epilepsy and must travel to Phnom Penh each month for treatment at the Kunthea Bopha Hospital. The project to help Thevi was completely funded by you all. For this we are profoundly grateful. You have helped make a huge difference.